If it is a private document that will be used only by you, then choose "Document Category" as "Personal Document", and choose the appropriate "Document Type" and "Upload"
All the practice documents, consent forms, etc. which are accessible to all the members of your practice can uploaded as "Practice Documents". These documents can be shared with the patients while scheduling appointment, from "Handouts" section of the encounter screen or from "Patient Dashboard > Documents" section. 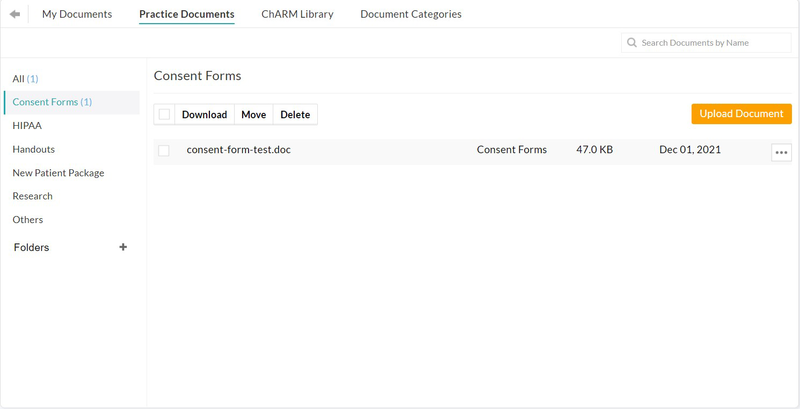 You can also share documents with the "ChARM Library" or import documents to your practice from the library.